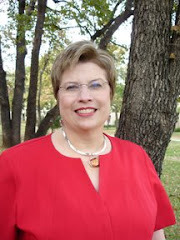 We wound up our visit to San Antonio much too soon, vowing that we would be back to see more. This could easily be a home base for us but, unlike the Rio Grande Valley, most of the RV parks are not particularly attractive for snowbirds. However, Travelers World is a nice park, friendly, close to everything and well maintained. For example, here is a photo of a groundskeeper tidying the gravel with a rake affixed to a golf cart. This is done after every guest's departure and afterward, the attendant sweeps up any gravel pebbles that may have crept onto the paved access road. Frankly, I don't think I've seen this done before, and I was pretty impressed. Normally, we prefer hard surfaced parking areas, but these gravel ones were very well done. We were lucky to have longtime friends Bubba and LouAnn join us for a couple of nights. They drove down from Fort Worth in their Thor Tuscany motorhome, and we had a good time with lots of laughs. 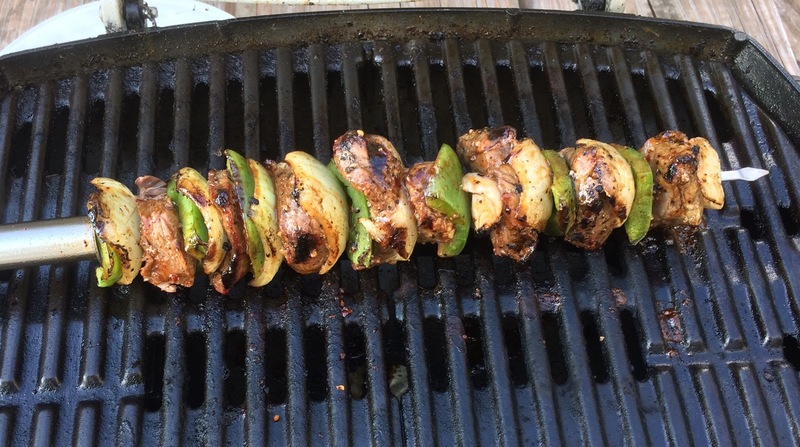 Oh, and did I mention that shishkebab, which we did some time ago, was also wonderful? I'm not sure how they fry the tortillas to make them puffy, but we liked them a lot. 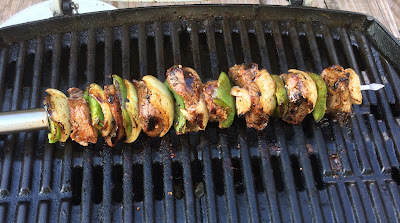 And the stuff they put in them--in this case, beef and chicken fajita strips--were wonderfully tender and flavorful. This is another mom and pop joint where you can get really good food for a really cheap price, and that's why it goes on our favorites list. Keep in mind that this map can be expanded or shrunk with your fingertip gestures on the screen. You can go to a wider view to show your entire route if you wish. With that in mind, guess what I don't need any longer? A paper map! If this weren't enough, it will also display weather, temperature, wind and elevation along your route. 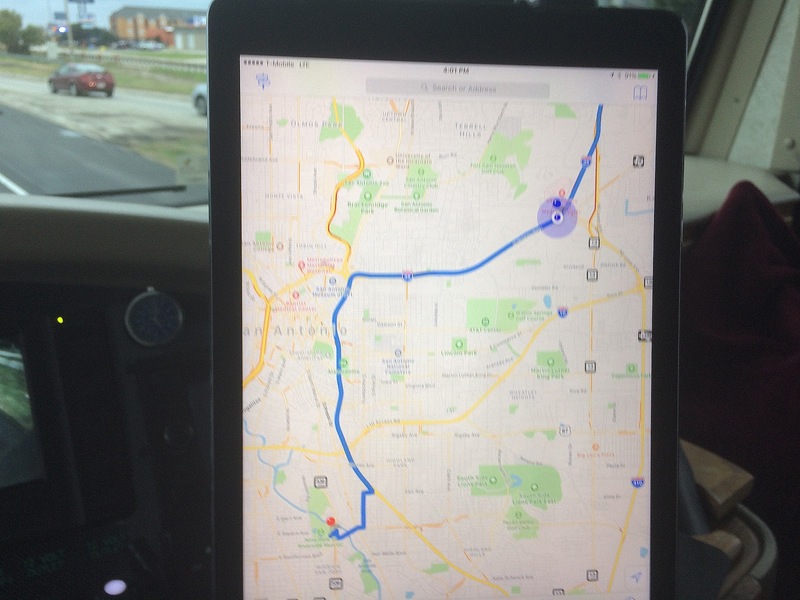 You can also use it as a GPS, but I prefer to leave the Garmin going and keep the map view on the iPad screen. This is the handiest thing I've seen in a long time, and I'm beginning to wonder how I lived without it! The app is called Inroute, and it's free, unless you want to get the added features like weather, wind, etc. I like this one because it shows RV parks, campgrounds, Wal-Marts, rest stops, some truck stops and a bunch of other things that are selectable, and it's free. This screen shows our current RV park on Lake Conroe via the orange dot. The view can also be adjusted to show as large or small an area as you wish. 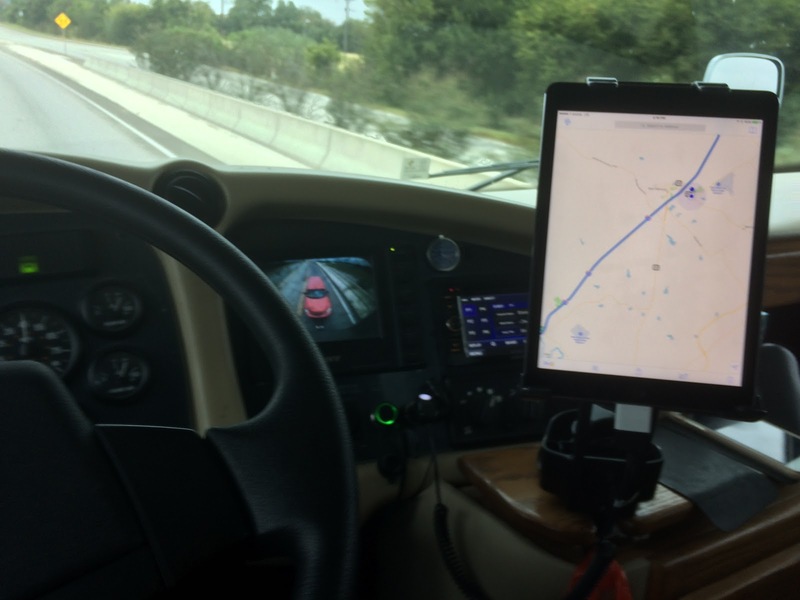 And here is another app I like even better, called Trucker Path, where I can see all of the above and more, including a much greater number of truck stops and and truck service facilities--very important to big rig owners. And, it will also show you low overhead clearances. Not bad, huh? This one is also free. Having all this information at my fingertips is amazing, but I'm very careful not to use it to the extent I get distracted from driving. 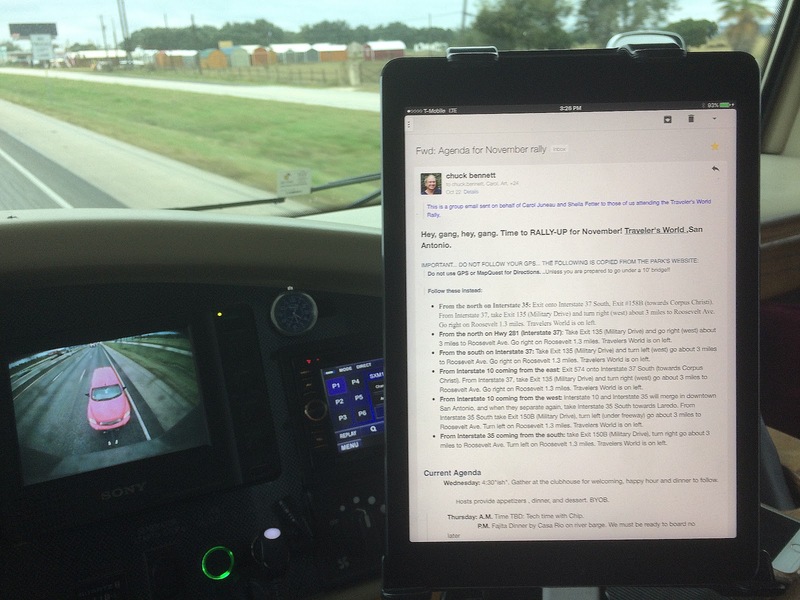 Since it is not far from eye level, it only requires a glance every now and then, much like the GPS. Now, you may be wondering what the constant use of this while enroute will do to your data plan. Well, it would probably be devastating unless you have unlimited data, which I do, via T-Mobile. Yes, I said T-Mobile. They do have such a plan now, and I have been astonished at the coverage it has, even in rural areas; I had thought it was pretty sparse until I tried their plan. They seem to have come a long way in their coverage reach but, even so, I still keep all my other devices, including a hotspot, with A T and T. I'm sure T-Mobile won't be able to match their coverage for a long time. If needed, I can fire up the hotspot and run the apps if I wish. Well, that's a lot of information to absorb in one post, isn't it? That may have to suffice for a while, as we will be in this area for a couple of months during the holidays, and we will not be posting as often. But stay tuned anyway; who knows when something will pop into my feverish mind. We rather enjoy touring historical homes that open their doors to the public so, after church, we were eager to have lunch at the Guenther House in downtown San Antonio. This lovely old house was built on the San Antonio River in the late 1800s by Carl Gilmar Guenther, a German immigrant who founded on the site a successful flour mill that later became Pioneer Flour Mills and still thrives today as the oldest family-owned business in the state. The mill originally used the flowing river water for power, hence its location on the riverbank. Guenther raised his seven children there, and the house continued to be used by the family until the 1940s. It was eventually opened to the public as a museum, gift shop and restaurant. We ate inside, ordering an egg-bacon-sausage-biscuit breakfast for me and southwestern quiche for Sandy. Expectations for a good meal were high after several recommendations but, alas, not all was well on this visit. My breakfast was almost cold when it arrived, and nothing on the plate was memorable. Especially disappointing was the sausage, which was little more than a tasteless hockey puck, and the biscuit, a spongy and unidentifiable blob with not nearly enough shortening; this should have been an amateurish embarrassment for Pioneer Flour, whose name was lavishly mentioned on the menu. The chef should have trained under Sandy's mother and grandmother, who definitely knew how to make a proper biscuit. On the other hand, the quiche was quite good, although slightly overcooked. The final nail in the coffin was the meal's wildly inflated forty-dollar cost. I tried vainly to justify having chosen to eat lunch here by telling myself that the tour of the house had been free. Perhaps another visit would provide a different experience, but I just don't think that's in the cards. However, it gives me just a tiny bit of comfort to ban the Guenther House Restaurant from being listed on my Favorite Restaurants page. 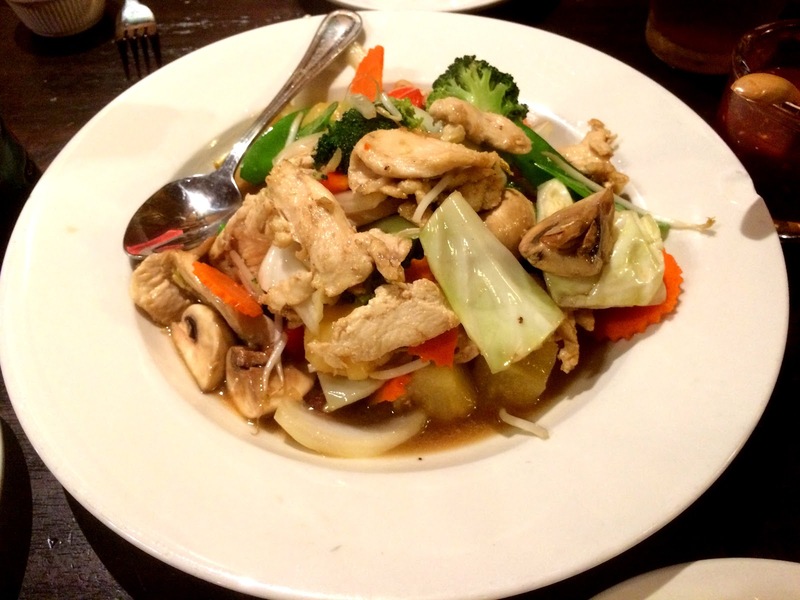 We had an experience that evening that made up many times for the unsatisfactory lunch. Inviting us for dinner were none other than Bob and Susan, the distaff member of the couple being better known to our RV blogging community as the author of "Travel Bug Susan." We had met these fine folks a few years ago at an RV Dreams rally in Kerrville and had been following their widely-read blog ever since. 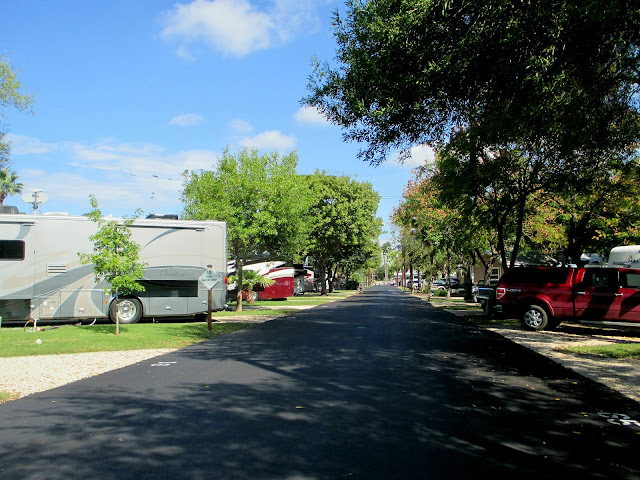 Bob and Susan had been fulltiming for a few years before discovering San Antonio and re-entering the workforce after settling in this RV park. Bob is an accountant and Susan works part time here at the park office. Susan served us some excellent turkey chili, and we enjoyed the fellowship immensely, learning a new board game in the process. It's always a neat pleasure finally to interact with our fellow bloggers, whom we think we already know by having read so much about their travels and experiences. This gives us the benefit of a start in our relationship from a point way beyond that of being mere acquaintances but, indeed, friends. And thus it has been with all the bloggers whom we've met over the past ten years. 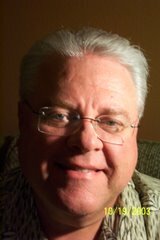 In fact, I have been inspired to begin another blog page listing those that have transitioned from cyber friends to personal friends. I'll have it up and running pretty soon. San Antonio is one of our favorite Texas cities, so we were delighted when our club, the Texas Bluebonnet Allegros, decided to hold the November rally there. An affiliate of the national Tiffin Allegro Club, this group meets eight times a year for fellowship, food and fun at various locations, usually in Texas. We had joined before we became fulltimers, but we keep attending, although it's not always easy in our current lifestyle. This is because the members are great people, and we share a common interest as Tiffin motorhome owners. Ours turned out mighty tasty, if I say so myself! They don't get any more nondescript than this. Fishland (although the sign doesn't say that) is really less of a fish market than a tiny restaurant with about a dozen tables, where you order at the counter and put your paper goods in the trash when you leave. Making this a favorite is the expertly fried, ridiculously fresh seafood. The catfish and shrimp combo was enough to share; it was delicious and, best of all, dirt cheap! Where else could you get this for just under ten bucks? Yes, you read that right--the second best enchiladas. Where do you find the best enchiladas, you ask? Well, they are at El Palenque in Spring, Texas, near Houston. No need to doubt me on this. One little hiccup here: Don't get the Tom Ka Gai soup; it's too sweet. The donut shop shares a building with a Mexican restaurant that has good reviews, although we haven't tried it yet. I would show you a photo of the donuts, but something happened to them before I could snap the picture. Just can't figure it out. The donuts-even though several hours old when we arrived--were crazy good. Now I'm in a quandary, as I'm not so sure Krispy Kreme is the best any longer. 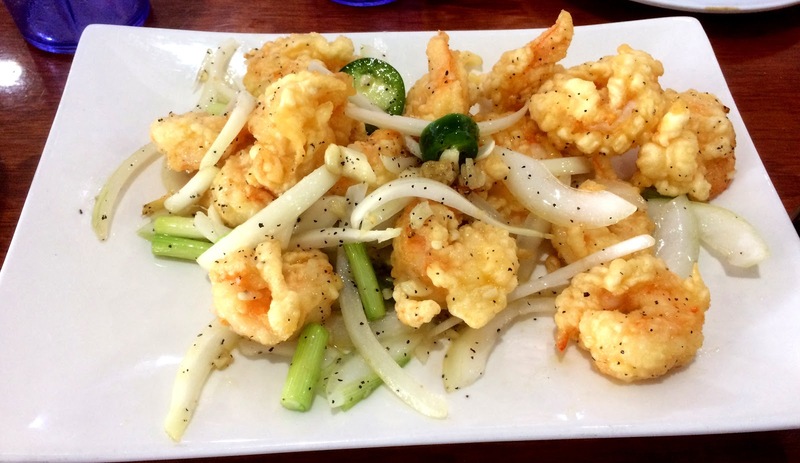 It's salt and pepper shrimp, loaded with fresh onion and jalapeno slices, just as I like them. I loved this dish, but then, I happen to really like onions a lot. By the way, did you know that a fresh onion is one of the most nutritious vegetables you can eat? It is loaded with dietary fiber, vitamin B6, folate, potassium, manganese and vitamin C. Knowing this as you now do, it appears you have a choice: Nice smelling breath or long life. I would choose long life; you can always make new friends. Well, there you have it. 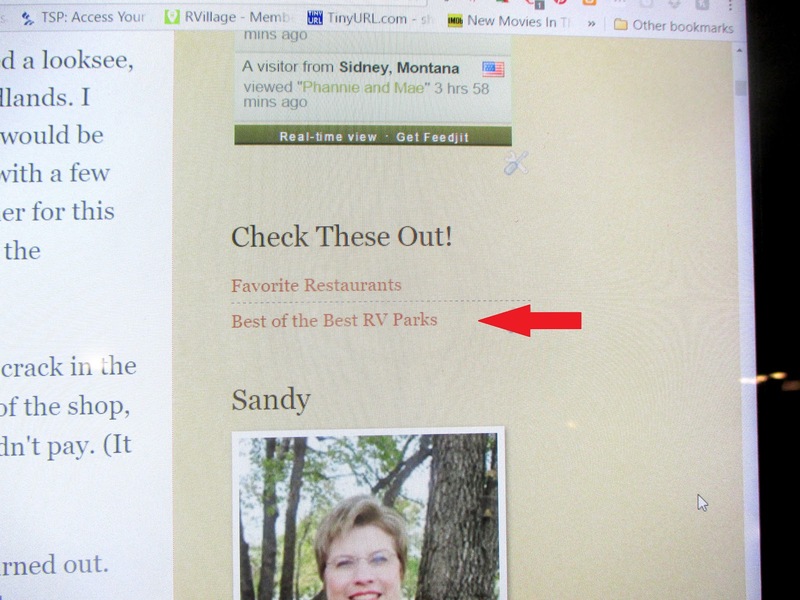 I think this is the first time that every single restaurant we tried made it onto the favorites list! I hope you find that list and the "Best of the Best RV Parks Page" useful. As we have been winding down our stay here in the DFW area, I have had some spare time to finish an enhancement to the "Best of the Best RV Parks" page linked in the far right column of this blog, just above Sandy's photo. That enhancement is that I have added a website link to each park named in the list. If you haven't looked at this page in a while, you may not have seen that the list has been refined and expanded quite a bit. I started this page because I couldn't find a reliable web source where I could quickly find the better quality RV parks for those occasions when we wanted a nice place to stay. The Big Rig Resorts website wasn't reliable, as they include way too many lower-tier parks, and they don't keep their contact links current. The Good Sam directory has a starred-rating system, but what about those parks that aren't members of Good Sam? As I have written previously, we don't consider ourselves prima donnas who only park at luxury resorts. Why, Phannie, because of her age, would probably be turned away from the really gold-plated ones. In fact, when we are on the road, we typically look for the best discounts we can get for our overnight stops, irrespective of the parks' condition (within reason, of course). However, when we reach a destination for a long stay, we like for our surroundings to be pleasant and appealing with plenty of amenities; we don't mind paying a little extra for that. Pet peeves would be parks that are crowded, junky or unlevel. And the worst offense would be having to park in dirt or mud. We just wouldn't stay long-term in places like that. I've spent many hours on this research, perusing all the photos I can find, along with using Google Earth to help determine if a park qualifies. Of course, we have stayed at quite a few of the locations ourselves, so those were easy to evaluate in person. At the beginning of the page, I list the criteria upon which the parks are qualified. Besides the standard listing, those listed in bold letters can be thought of as the "best of the best of the best," where you can count on a really upscale experience (with a price tag to match, usually). 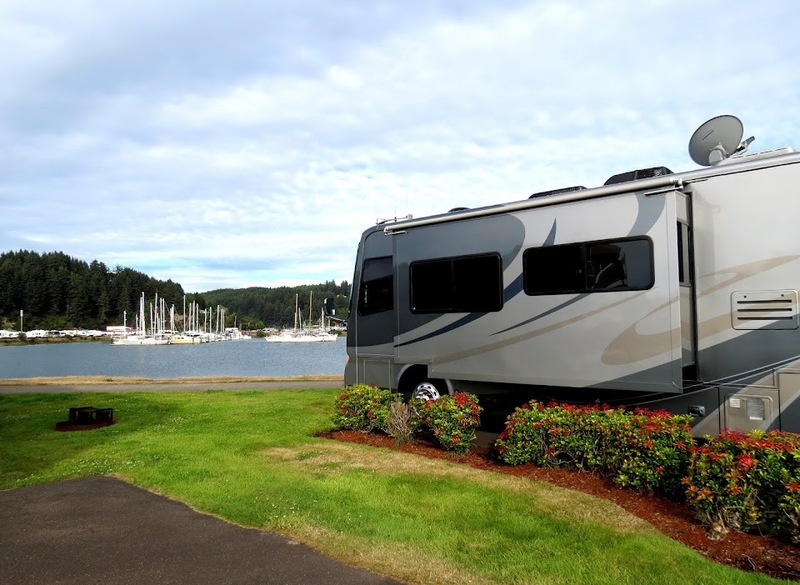 Surprisingly, some states have no RV parks that--in my opinion--belong on a list of the best in the country, so you'll notice that a few states have no listings at all. Oh yes, and I've listed only those parks in the lower 48; we're not likely to take our RV to Hawaii, and we just don't have enough backbone to drive it to Alaska. As you check out the page, you should know that it is definitely a work in progress, and here's where you could help: If you know of a park not listed that should be included (I can't possibly have found them all), consider letting me know, so that I can add it. And if you find a park that you think I have assessed incorrectly, I would really like to know about that, too. Just leave a comment on the blog or send me an email at [mike dot sandy dot mills at gmail dot com]. I'm not planning to make this page into a commercial website. (I don't want a job; I've discovered that being "retired" is not much different from being "lazy.") It is offered to Phannie and Mae's audience as a 'thank you' for visiting the blog. Feel free to link to it if you wish but, since this blog is copyrighted, it would not be quite legal for it to be posted elsewhere without attribution. A linkback to the page in your text would also be fine. So, that's it. I hope you find this list useful, and I hope you will help make it better and more complete with your suggestions. I'll be sure to thank you for your contributions.